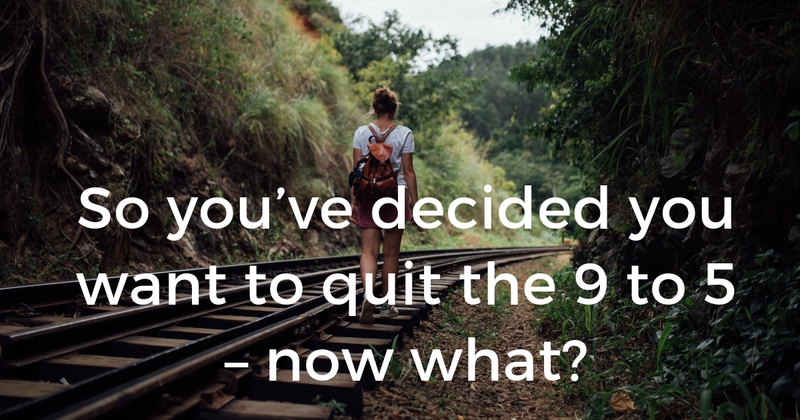 So you’ve decided you want to quit the 9 to 5 – now what? Not knowing where to get started can keep you stuck and in inaction (or, alternatively, you may rush into doing lots of things that really won’t help you move forward at all). These past few weeks, we’ve been looking at why you should quit the 9 to 5 and why it’s never too late. If this has resonated with you, and that growing feeling inside is bubbling to the surface as you begin to contemplate taking those steps outside the 9 to 5… well, now what? Not knowing where toget started after that can keep you stuck and in inaction (or, alternatively, you may rush into doing lots of things that really won’t help you move forward at all). When you’re starting a business, and especially when you’re doing so alongside a full-time job, you only have a select few hours per work when you can work on the business. You need to be absolutely sure that you are using those hours effectively and not wasting your valuable time, so that you make progress and ultimately get to where you want to be. DON’T… Hand in your resignation and tell your boss to f**k off at lunch today. I think this one is self-explanatory. It’s about not burning any bridges – your professional network will be key to your future success – and not taking any drastic action until you’ve sorted yourself out and you know what you’re going to be doing and when. DON’T… Wait for someone to tell you it’s a good idea, to give you ‘permission’ to go ahead. I know it’s tempting to look for reassurance from other people. By all means take comfort in knowing that others are making it work – but this is your life, your business, and only you can make the call on what shape your business will take and how you’re going to make it happen. DON’T… Invest in a two-year MBA at a top university or a long course that will take hours of your time per week. Depending on your business idea, it may well be necessary or at least desirable to have some formal training or qualification – for example, as a therapist or as a coach – but don’t commit to such a big investment until you’re really sure this is what you want to do and it’s absolutely necessary to move forward. Formal qualifications are far less valuable these days, especially as an entrepreneur. DON’T… Find an investor or take a massive bank loan. If your business idea is based on a product, or you absolutely need a physical space, then you may well need some substantial upfront investment. It’s far lower risk, however, to start with a service business where you can hit the ground running with an offer that gets you paid right away, with minimal moving parts and minimal investment needed. DON’T… Come up with a detailed, ten-year business plan. I’m all for having a strategy with a vision and a rough plan of how you’re going to get there, but you don’t need a convoluted PowerPoint deck when you’re a solopreneur. In any case, it’s impossible to plan out exactly what your business will look like that far in advance. DON’T… Spend lots of money on a custom-designed website, hundreds of business cards and fancy photography. I know, it’s fun to work on logos and business cards, and branding is important, but you don’t want to get caught up in being internally focused on things that aren’t going to be critical to bringing in clients and aren’t strictly necessary when you’re just starting out. DO… Do the maths. Money is going to be central to managing a smooth transition out of your full-time work and into your business, and you really must be on top of the financials. This means having a full picture of your personal finances, your expenses, savings accounts and so on. It also means mapping out what you need to earn in the business for it to make sense and how many clients, and at what price, you’re going to need to get you there. DO… Network. I know, ick! ‘Networking’ has horrible connotations and a lot of us just don’t like doing it. But all my consulting work in the first couple of years came from my connections, for which I’m incredibly grateful, and you just never know when a stranger or a friend of a friend can prove instrumental to helping you reach your goals. When you’re moving into a different sector or role, you’ll need new contacts and connections outside of your existing network as well. DO… Start building an audience. It’s nerve-wracking to start putting yourself out there, and it’s easy to put this off until you have the perfect branding and positioning. However, it takes time to build an audience and you can’t expect to one day put up an offer and have lots of people buy from you. You need to start building the audience so you have someone to sell to when you’re ready. DO… Swallow your pride, accept that you’re learning and ask for help. Yes, yes, you’re smart and capable and you can do it all yourself, I know. But you have to recognise that you are at least to some extent starting from scratch. Asking for help is not a sign of weakness, and finding someone who is a few steps ahead of you to mentor you through the process will make the whole journey much faster and more fun. DO… Find your tribe. It can be isolating to work on your own business, especially if you’re the only one in your existing friendship group who’s doing so. In addition to finding a coach or mentor, you’ll also want to find a community of like-minded people who will cheer you on and share in the journey. My Facebook group is a great place to start! DO… Remember why you’re doing this. Let’s be honest here, it’s going to take hard work to get this business off the ground and up to a level that’s sustainable for you and your family. To have the persistence and resilience you’ll need to make it work in the long term, you’ll need to be super clear on your reasons for doing this and why it’s so important to you – that’s what will keep you going, when it inevitably gets tough. Making the decision, resolving to make a change, is a massive first step. But it is just that, a first step. What you do now will be critical to making this career change, and business, work for you. Discover stories of others who have left the 9 to 5 along with tips on how you can do the same by joining the waiting list for my book, Leaving the Corporate 9 to 5: Stories from people who’ve done it (and how you can too), available on Amazon on Wednesday 3rd October 2018. Anna Lundberg is the founder of One Step Outside, where she helps people around the world build businesses and create a lifestyle that allows them an unimagined sense of freedom, flexibility and fulfilment. Since leaving her corporate job in 2013, she’s now reimagining what success looks like and she’s passionate about inspiring and supporting others to do the same.